very inspiring and helpful, thank you Sandra! Sharing the similarities in my Higher expressions. We are all unique expressions of Source exploring Source; the discovery of a through-line in a few of my expressions that I AM able to access was fascinating to me. Side note: the baby spider made it safely back to town, he is now twice as big and enjoying the view from the front window’s houseplant. I visited my sacred circle yesterday before the snowstorm arrived. I AM working with Golden Solar Heart Center expansion through the gateway. 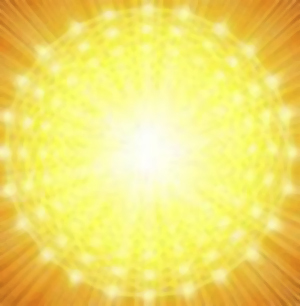 Some vibrant light Masters using brilliant frequencies joined me, sending gold-diamond-crystalline light to support my expansion. Just lovely to have such bright light on a gloomy day in the cold woods. I place my crystals right on Gaia for this kind of work, in this case in the ice-snow which covers the mountain. Look at what one of my crystals encoded from this exchange – streaks of gold and veins/shafts of 5D rainbow colors. The rose quartz picked up some gold as well, however it is difficult to photograph (as is the quartz). Hope you can see it! The sensations and visions of the expansion can be felt when I hold it by my heart. Use your crystals, lovelies ~ speak to them, program them, work with them during the gateway! To learn more about crystals, 5D expressions and connecting with them, take The Ascension eCourse. Ascension: a conscious evolutionary process which integrates a higher frequency of vibration into the physical body. Ascension activates the Divine HUman (Crystalline/ Christed/Krysthl) state of consciousness and merges the Higher (5D/6D) and Lower (3D/4D) expressions of the Self. Our planet ascended to 5D in December of 2012. This means a platform for the new experience of the return to the true HUman genome is provided. Kindwhile, HUmanity is able to transition from the 4D platform we currently experience to the 5D platform which eventually will merge with the lower 4D expression of Earth. Ascension is a change in frequency. Dimensions are based on vibration. Each dimension has a range of frequencies which create the reality or experience within that dimension. Anything living on a planet must resonate with the vibrational level of that planet (or higher) or it cannot exist in that reality. As the frequency of the Earth rises, everything on her surface is affected by this increase in frequency. Ascension is the process of frequency change in order to evolve to a higher vibrational state. Visit the Services area for supportive methods, tools and sessions with Sandra. The Shift, jump time, evolutionary upgrades in consciousness and the ascension process have been discussed for years in spiritual circles, and for millennia in ancient cultures. Waves of unique cosmic energy have been surging through our galaxy for decades, and the 2012 window of amplification has arrived. Ascension is a change in frequency. Dimensions are based on light and sound vibration, or frequency. Each dimension has a range of frequencies which create the structure for experiencing a certain kind of reality. Third dimensional reality is the lowest density (frequency) which a human expression of consciousness may experience. There are many side effects of the old 3D reality, including the illusion of linear time, the inability to perceive higher dimensions, and spiritual amnesia, where the memory of past lives, experiences in other dimensions, and connection to the rest of the Universe is forgotten. But all of that is changing during the Shift. This is why the phenomenon of “awakening” is so widespread; we are waking up from the amnesia of 3D and reconnecting with higher dimensional consciousness. Severe weather and climate change are imminent due to the drastic reduction of the magnetosphere. Global warming is simply the collapse of the astral planes of consciousness as we go through the Shift. Earth is constantly balancing magnetics as 3D dissolves. The doom timeline – a complete destruction of everything on her surface – has been eliminated thanks to the amount of awakened consciousness on the planet. She is heavily influenced by the collective consciousness, and millions have been connecting with her to smooth the transition during the Shift. The collective consciousness of humanity both helps and hinders the transition through thought, intention and actions. The Shift and ascension of Earth are inevitable; they cannot be stopped. How dramatic the Shift will be depends upon how quickly humanity embraces the change to a higher frequency.